Empowering the strategic development of Europe’s regions is a critical requirement for transforming the EU into a competitive knowledge-based economy. To this end, regional decision-makers need to be enabled to design and implement better RTDI policies, and also to benefit from a better coordination of regional, national and EU policies. By developing and testing a new model of transregional foresight, the ForTransRIS project supports this aim. It thus contributes to the improvement of regional innovation strategies (RIS) through a transregional perspective. 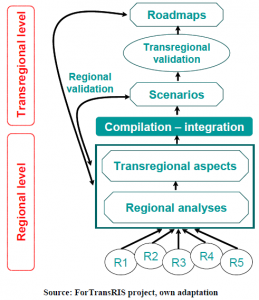 The transregional foresight model to upgrade RIS is tested in the five partner regions taking the issue of transregional knowledge and technology transfer as a concrete case. for the ERA, 2007). In this context, empowering the strategic development of Europe’s regions is a critical requirement for transforming the EU into a competitive knowledge-based economy. because of the cohesion ‘risk’ it could pose for the European Community if some regions remain marginal in terms of knowledge-based activities. An additional contribution to a more competitive EU is achieved when the strategies in the different regions are developed in a way that leads to an overall optimisation of programmes and priorities in the EU, at and across governance levels. the effective introduction of a user perspective on the application of science and technology for economic growth and social enhancement. The strength of a foresight approach to RTDI policy-making stems from bringing together specialised technical expertise (both technology expertise and foresight process know-how), diverse, distributed local know-how and broad participation of stakeholders. The complexity of the policy challenges requires technological expertise; local knowledge and broad stakeholder participation serve to feed and anchor expert deliberation and ensure the relevance of such expertise to the outcomes and the implementation of the foresight exercise; the process know-how ensures that successful strategies are formed as a result of the comprehensive collaboration of all these different resources. The project aimed to raise awareness among decision-makers in Europe’s regions and encourage them to benefit from the knowledge and experience that can be gained by applying foresight in their own regions. Participants were regional policy makers and development agencies from Navarra (Spain), StuttThe policy-makers thus need to move from the traditional topdown, reactive approach to one that is proactive, participative, evidence-based and uses transparent methods in finding solutions to the modern policy challenges. The new approach embraces foresight and related tools not only to gain access to difficult-to-acquire strategic information for decision-making but also as socio-economic mobilisation tools to raise awareness and create consensus around promising solutions. innovation policies rely on policy intelligence that enables all actors to develop shared visions and long-term commitment between the triple helix stakeholders (university – industry – public actors) in the innovation system. Successfully linking strategic knowledge on both levels will lead to better economic decisions, which in turn lead to increased and sustained business and regional competitiveness. This challenge necessitates the tailored application of foresight exercises on all decision-making levels, from European, national to (trans-)regional, cluster and individual company levels. Especially the regional level with its specific abilities and potential should be taken stock of to align governance levels both horizontally and vertically. To do so, there is a need for more systematic regional foresight applications. Thus, further progress is needed in various respects to facilitate the use of foresight approaches on the regional level by 1) adapting foresight methods and related tools, 2) adapting and tailoring the implementation of foresight exercises, 3) positioning regional foresight exercises in the respective policy context and, finally, 4) improving regional foresight exercises through transregional cooperation. The FP6-funded project ForTransRIS, which ran from January 2007 to December 2008, concretely tackles the aspects outlined above and especially deals with improving regional foresight exercises through transregional cooperation. The project aimed to raise awareness among decision-makers in Europe’s regions and encourage them to benefit from the knowledge and experience that can be gained by applying foresight in their own regions. Participants were regional policy makers and development agencies from Navarra (Spain), Stuttgart(Germany), Brittany (France), Stockholm (Sweden) and Liguria (Italy), supported by foresight expert partners in each region. The ForTransRIS project developed and tested an approach to improve regional decision-making by applying regional foresight in a transregional perspective (see graph below). 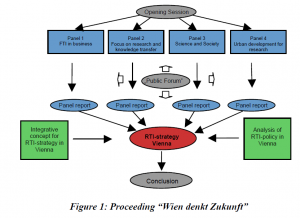 The transregional foresight exercise was developed building on the experiences and needs of the participating regions and aiming to enhance the individual regional innovation strategies as well as the general ability to apply foresight for regional RTDI decision-making by way of this cooperation. Once the structure of the exercise had been set up, an analysis of the five regional innovation systems was carried out by the regional partners. They conducted desk research and interviews with all relevant regional innovation systems actors by using a structured questionnaire to identify the innovation needs, barriers and future aspirations as seen by the stakeholders. In addition, opportunities and challenges for knowledge and technology transfer within and among regions were identified, which (can) result from and facilitate transregional cooperation. 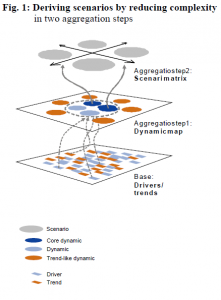 In a next step, the foresight experts synthesised and compiled the regional analyses into a smaller number of drivers to find out which issues are most relevant for each region and at the same time most promising to be dealt with on a transregional level. among the regional innovation stakeholders. workshops in each partner region. There, it was discussed if the scenarios were indeed feasible for the region and which issues were most relevant. The most relevant issues from each region were then matched to find out which issues were most relevant for all regions. – entrepreneurial attitudes of public research. successful development of their own region and to fostering the coherence and success of European programmes, priorities and policies. The UPRIS foresight exercise built upon the Regional Innovation Strategy (RIS) of the Lower Silesia region in Poland. The foresight complemented RIS with a broader based and longer-term know-how for sustainable regional development. It was a participative process involving panels of experts and regional stakeholders, which were to discuss future challenges facing Lower Silesia and possible options for meeting them. The panels elaborated normative scenarios, which served as a basis for developing an action plan for RIS and a plan for trans-regional cooperation. In this way, a cornerstone was laid down for sound, well informed and future-oriented policy-making in Lower Silesia. The objective of this research project is to identify the foresight requirements of German small and medium-sized enterprises (SMEs), their corporate foresight activities, to the extent that they exist, and limiting factors for systematic foresight approaches. To this end, an expert survey was conducted with SME decision-makers. Its purpose is to make executives more aware of the indispensability and the potential foresight offers in changing markets and business environments, and supporting them in their foresight approaches. 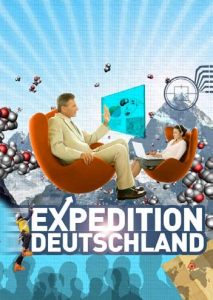 The automobile industry is one of the most important industries in Germany and one of the key areas for R&D. To hold this position the industry has to face two challenges: 1st, changing parameters in and for industrial production like minimizing the time to market or shortened product life cycles; and 2nd, demographic change. The purpose of the study was to identify need for action and to present sub-sectors in which ICT could take a supportive role for industrial production.